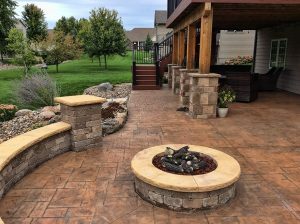 If you’re in the Des Moines area and thinking about building a new paver patio, or revamping an existing one, there are many options to choose from in terms of materials and design. There was a time when the word “patio” meant nothing more than a square or rectangular area made of concrete, but that’s no longer the case. 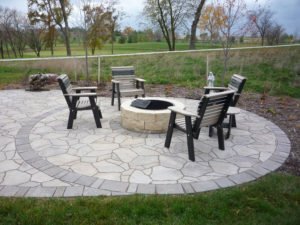 At Earthly Possibilities, it is no secret that we are partial to our local Des Moines suppliers of Unilock Backyard Patio Pavers for our paver patios. Besides the fact they are well-suited for our region, which is ripe with historic homes and neighborhoods, Unilock is also just a higher quality product. It is highly durable and a nice benefit is the fact that Unilock pavers and block will not fade over time. It’s absolutely going to hold up for your patio and other hardscaped elements. It also has a timeless look. In fact, the biggest selling point for Unilock their quality. There’s really no question that people love Unilock. 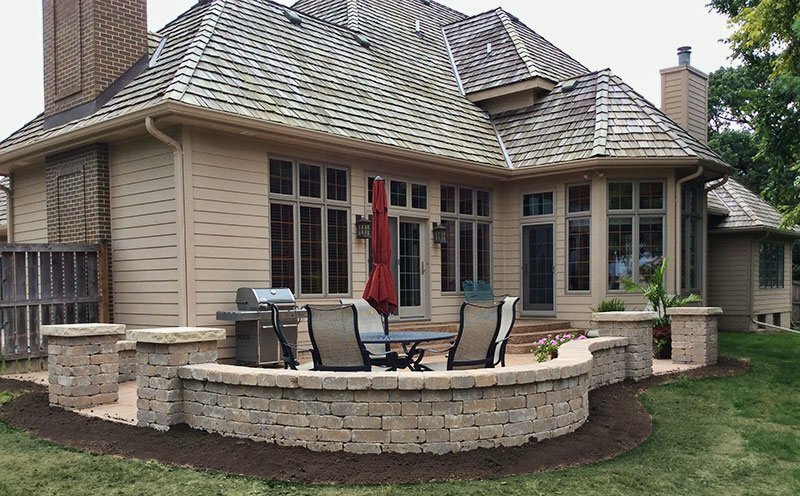 With a project as important as your patio, that’s exactly what we’d advise. Of course, in the end, the decision must be yours. Unilock does cost more—typically double the cost of pavers on a large job. On a smaller patio project, the cost may be a bit more comparable. However, we believe Unilock has many benefits that make it a superior product to other pavers, and therefore worth the cost. Material Selection – Patios can be constructed using a wide variety of materials, including concrete pavers, clay bricks and natural stone. Each of these materials has its own benefits, and each can fit in with a variety of landscape styles. Location – Nope, we don’t mean Des Moines! 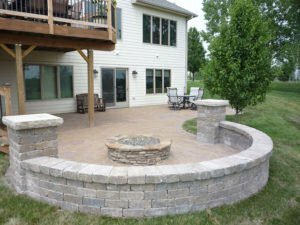 Do you want your patio to be attached to your house, or would you prefer it to be a stand-alone element in your landscape? How much sun exposure do you want? Is the site you’ve chosen on even ground? By planning carefully, you’ll be much happier with the end result. Earthly Possibilities, in Des Moines Iowa, is here to provide you with any help you need!